Discussion in 'Portable Headphones, Earphones and In-Ear Monitors' started by Barra, Oct 30, 2018. I can say with confidence, that the majority of portable gear/CIEM loving Head-Fiers have been eagerly following the new impressions of Empire Ear's new Phantom CIEM. 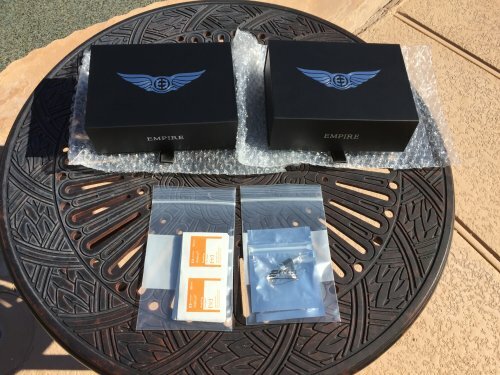 There has been a flood of new Phantom owners out there and an impressive amount of positive impressions from these new owners. The conversation has traditionally been about the Zeus as the king of the hill - but the Phantom being the new kid on the block has been "killing it" making me wonder if it was supposed to replace the Zeus. Don't know about you (or maybe I do), but when this kind of buzz hits Head-Fi, I have to know what it is all about. On further inspection, I found that the Legend X which again has a good deal of buzz was the more expensive of the two new CIEMs by $500. I also found that the Zeus was only $100 more than the X. The X also turns out to be a hybrid - turns out that sometimes I really am the last to know. So Empire Ears now has two promoted lines the X Series with the Legend X and the EP series with the Phantom and finally the Legacy series - that can only be found in the index at the bottom of the page - that contains the Zeus. SPOILER ALERT (cover your wallet's ears): turns out they are all incredible stand out performers with different tunings - worth having all three. So finally, I got my chance to sit down with Jack and hear what all the commotion is all about at RMAF 2018 three weeks back and wow, they were all fantastic. The Zeus was as good as I remember going for more of an audiophile tuning very much like my HD800. The X on the other hand was more of a fun tuning with gobs of thick detail and huge bass without ever sounding congested - fun audiophile. The Phantom turned out to be somewhere in the middle with a little thicker note and bigger bottom, but not much. So if you loved the Zeus, but wished that it had more bass, you got your wish. On to the challenge, after listening to both the Phantom and the X - I loved them both but loved the X more. That is going against the common theme and I think I know why. The X required about 85 percent of my iPhone volume while the Phantom was happy with a little over 40 percent. The Phantom sounded terrific with my iPhone and sounded just as good with the available Hugo 2 while the X sounded great with my iPhone, but out of this world with the Hugo 2. I think the Phantom scales down better for general use and usability, but the X likes to be pampered a little more with the good stuff. I am going to test this theory..... first with the universal version in the tour kit, then with my custom version once it arrives. Yes, I liked it that much. It has always been my opinion, YMMV, that the customs offer more isolation and better reach both directions allowing them to scale further. But I want to hear from you - which do you like better? Erfan Elahi, Devon Higgins, SilverEars and 2 others like this. The participant list is organized logistically to minimize shipping costs starting from the West and moving toward the East Coast. The tour will begin with the first in the list for a 7-day audition. Thereafter participants will be responsible to deliver or ship the demo kit to the next participant in the list. State Issued Photo ID: We need a picture of your driver's license or other qualified ID with photo and that reflects your home/shipping address. Phone Bill: We need to verify your phone number and address with a photo of a current phone bill showing your name, phone number, and address which matches your ID. Email Address: We will be managing the tours through email which requires an email that you can respond to within 24 hours. This information must be emailed to billb@ClearDiff.com before your name will be added to the participant list. Prequalification: If you have already provided this information to join one of my other tours, you are good for one year prequalifying for my other tours. However, if it has been on file for over a year, you will need to resubmit to remain current. Qualification Exemptions (thru @BulldogXTRM): If you wish to join the tour, but cannot provide this information - you can contact Mike Brunner (@BulldogXTRM ) at bulldogxtrm@gmail.com with options for equivalent verification options that work for you to receive an exception. Please cc billb@cleardiff.com to keep me in the loop as we work through this exception process. Our goal is to keep you on the tour so we will work with you to make it happen, but we need a way to verify the shipping address and phone number. Information Security: All personal information will be safeguarded by @Barra and will be deleted by request after the tour or by withdrawing from the tour. 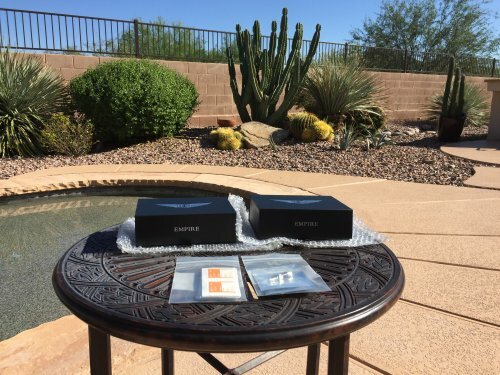 The information is stored on my personal computer is will not be shared with anyone other than to provide your contact/shipping information to the participant before you so that they can ship the kit your direction. When needed, you will be introduced in an email. Retained information is good for a year to join additional tours hosted by @Barra. Participants must understand and agree to these responsibilities listed below as well as take them seriously. Those that do not follow through with the agreed upon responsibilities will be blacklisted from all future tours. Please do not sign up for the tour if you feel there is any reason that you cannot live up to this commitment. Communicate: Those in the tour will be expected to be reasonably available to communicate in tour proceedings. Phone, PMs, and email should be responded to within 24 hours maximum. Failure to do so may negate your eligibility and potentially blacklist you from future tours. Protect: Participants are responsible for the value of the kit while in their care and will be expected to reimburse the manufacturer for any losses due to participant negligence. The kits should be handled with care and protected from theft. Each participant is responsible for the kit from signed receipt to signed receipt. While the manufacturer accepts responsibility in the case of shipper losses if you ship signature required, participants are still responsible for managing the shipper loss process to its conclusion until the proceedings are concluded. Providing tracking information and following the rules is critical in determining where your responsibility stops. At Receipt of Tour Kit: We need to know that the tour kit was received immediately to release the last participant from responsibility. Confirm Receipt within 24 Hours: Please confirm receipt on the existing email thread with myself and the sender within 24 hours so both myself and the previous party knows that the transfer is complete. PM Next 2 Participants: Please PM the next two participants in the participant's list (POST 3) to provide a backup in case the next participant is unavailable. Priority goes to the tour order as long as they reply within 24 to 48 hours. Next Participant Email Confirmation: Please have the next participant email you and cc me at billb@cleardiff.com to confirm readiness. Please request their full name, mailing address, and phone number for the shipper. Verification: Please wait to ship until I verify the shipping address by responding to that email that we are good to go. Visibility: Please always respond to emails “Reply All” so that I have visibility into the shipping process. Be Ready to Ship on Day 8: It is also your responsibility to ensure that you have shipped the kit to the next participant on the 8th day, so please be diligent in contacting and communicating with the next participant. Please never send a kit to a participant that has not responded even if you have their address from a prior tour. Communicate Problems/Issues: If needed, you can always reach me directly at my email me at billb@cleardiff.com. Impressions/Review (Optional): While optional, to keep things interesting on the tour, any impressions or insight that you can post in the thread would be greatly appreciated. Full reviews are even more appreciated. Verified Recipient: It is your responsibility to verify the recipient's readiness and their address with me before shipping. If you sense any issues, please contact me before shipping. Verified Address: It is important to make sure that you only mail to the verified address unless the two of you get an exception from me first. Signature Required: You must ship signature required (or insured) to avoid the responsibility of shipper mishaps. The manufacturer will assume responsibility if you follow the rules. Shipper Confirmation #: You must provide the recipient and me with the confirmation number by email within 24 hours of shipping. This will allow us to follow the progress and for the recipient to plan the receipt of the package since a signature is required. Responsibility Ends on Signed Receipt: Your responsibility ends when the shipper posts a signed receipt from the recipient. Post: Please post your name, city, and state only – no personal address in the public forum – and then declare that you agree to follow the terms of the tour. Example Signup Post: From Barra: I live in Anthem, AZ and would like to participate in the tour. I agree to follow the terms of the tour. Head-Fi Name: Please remember to include your Head-Fi alias so that I can match your email to your Head-Fi identity. Phone Bill: We need to verify your phone number and address with a photo of a current phone bill showing your phone number and address which matches your ID. That’s it. We reserve the right to turn down the application if we find a cause but hope to accommodate all those US Head-Fi’ers that are interested. If you follow these instructions, you are in. Signups begin now, and will remain open during the tour welcoming late comers. However, we reserve the right to end signups at any time so please don’t hesitate or you may lose out. The tour will start when we have enough participants to create a reasonable list. Have fun! We hope to gather our list over the next few weeks to build logistics into our tour order. The tour will begin on the West and East Coast and move toward the middle. We may start before we close our participation requests allowing latecomers to join in the process as it makes sense, but latecomer logistics will be first come first serve so likely to make postage more expensive. The good news is that we will do our best to accommodate all US Head-Fiers that wish to participate. I live in Anthem, AZ and would like to participate in the tour. I agree to follow the terms of the tour. I will have emailed my required ID verification documentation to billb@cleardiff.com. I live in Santa Clara, CA and would like to participate in the tour. I agree to follow the terms of the tour. I have already emailed my verification from multiple previous tours. Count me in Barra. I live in Sun Prairie, WI and would like to participate in the tour. I agree to follow the terms of the tour. You got all of my information already . I live in Brooklyn, NY and would like to participate in the tour. I agree to follow the terms of the tour. I will have previously emailed my required ID verification documentation to billb@cleardiff.com. I live in Boston, MA and would like to participate in the tour. I agree to follow the terms of the tour. Sign me up. I agreee to all terms and would love to participate in the tour. phantom is cool, but the lx is very unique and very impressive. I agree to the terms and conditions of the tour. My info is on file from u12/trio and ongoing audio cable tour. I've always wanted to hear the Phantom, being a current LX owner. Now I'll get my chance! I agree to the terms and conditions of the tour, I live in Honolulu Hawaii. Sign me up! I live in Houston, Tx, and I think you still have my information from the PW tour.